Have you ever wondered what mind mapping is all about? Members of the Quebec Family History Society Brick Walls Special Interest Group now know the basics, thanks to a presentation by one of their members, Cindy Kelly, at the SIG’s regular monthly meeting in February. Cindy described a mind map as a diagram used to visually outline information. To make a mind map, you place a singe word or text in the middle of your page or screen and place associated words and concepts around it. You can link branches representing other words to each main branch. Using a different colour for each main branch will help you organize your thoughts. SIG member Claire Lindell, a former teacher, commented that organizing material visually helps many people learn effectively. Mind mapping can also be used to help organize any kind of research problem. Cindy listed a number of different websites that offer mind mapping tools, then went into detail about how to use one such site, www.Popplet.com. Janice Hamilton showed how she is using Popplet to help with one of her genealogical brick walls. 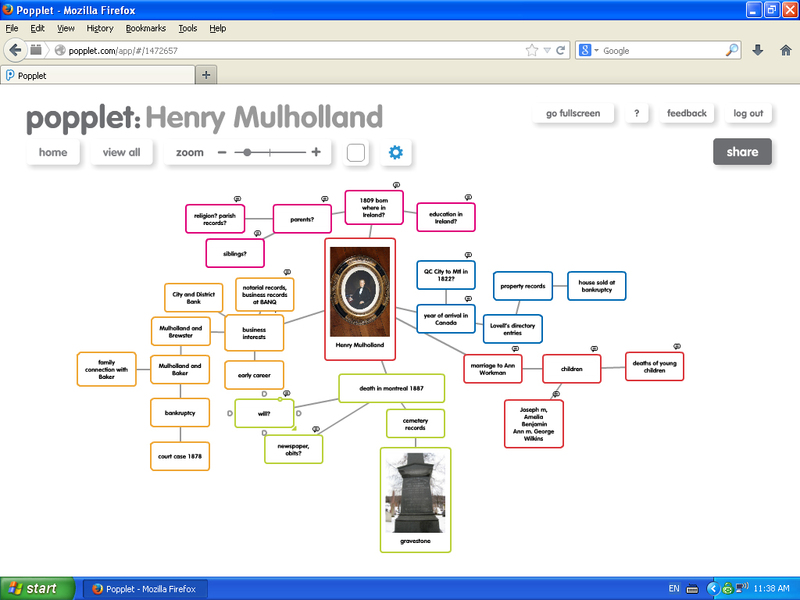 She put a photo of Henry Mulholland (born Ireland, 1809, died Montreal, 1887) at the center of the Popplet screen, then grouped questions she has about various aspects of his life around that photo: his unknown origins in Ireland, his addresses in Montreal over the years, his marriage and children, business ventures in the hardware field and banking, and reminders to look for cemetery records, an obituary and a will. She is using this mind map to generate new questions and ideas, and to keep track of her results. Mind mapping really is what we are tryong to do in our head, and get lost. With applications, everything is clear!